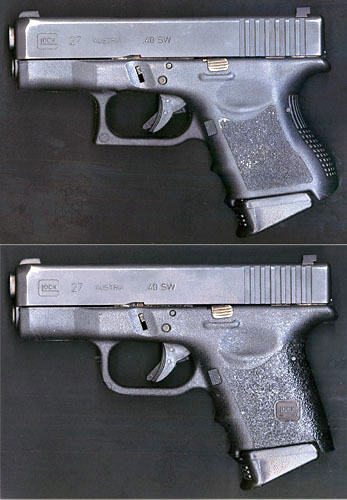 I’ve always liked my Glock 27, so far as reliability, power, and ease of operation go, but I’ve never liked the grip. It always felt too fat in my hand. Finally I decided to have the grip modified. I took the gun to Heritage Firearms in Austin, Texas. It took them longer than they said it would, but the guy did a pretty good job and the price was only $100. I find it hard to quantify the difference as far as shooting goes, but I like the feel better. 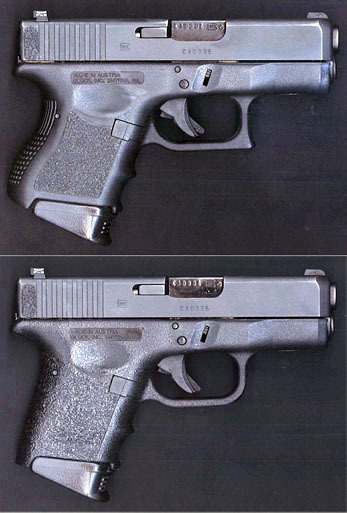 A lot of folks say the rounded lower portion of the Glock grip causes you to shoot high. I also had the trigger guard rounded. The modifications made no detectable difference in the weight of the gun, but cut the length by .25 centimeters. There is an excellent article by Shane Steinkamp online detailing how to do this modification yourself. Robar also specializes in Glock grip modifications, and they add cocking serrations on the forward part of the slide as well. There are plenty of other gunsmiths who offer this service--just Google it.